"Caldereta" redirects here. For the endangered bird, see Fuerteventura chat. Kaldereta or caldereta is a goat meat stew from the Philippines. 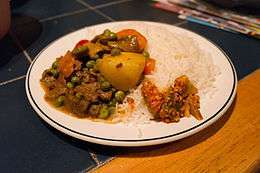 Commonly the goat meat is stewed with vegetables and a liver paste. Vegetables may include tomatoes, potatoes, olives, bell peppers and hot peppers. Kaldereta is a served at special occasions, parties and festivities. Variations of the dish use beef, chicken or pork. ↑ Dagoon, Jesse D; Dagoon, Aida L; Dagoon, Jasmin Flora L (1999). Culinary Arts I. Manila: Rex Book Store, Inc. p. 138. ISBN 971-23-2603-9. Retrieved 30 June 2016. ↑ Schwabe, Calvin W (1979). Unmentionable Cuisine. University of Virginia Press. p. 152. ISBN 0-8139-0811-6. Retrieved 30 June 2016.